Lenovo announced its Vibe Z2 Pro high-end smartphone at the end of July and the device is set to make an appearance at IFA 2014 in Berlin next week. Luckily, you won’t have to wait until then to find out our initial impressions of the 6” QHD monster, as we got to spend some quality time with the phablet a little early. The Lenovo Vibe Z2 Pro also marks the company’s high-end entrance in Europe and is its first smartphone with a QHD display. The Snapdragon 801 chipset at work inside the Vibe Z2 Pro is fast as a lightning thanks to its 2.5GHz quad-core Krait 400 CPU, Adreno 330 GPU and 3GB of RAM. It runs Android 4.4.2 KitKat out of the box with a custom Lenovo skin on top. As most Chinese manufacturers, Lenovo thoroughly customized the user interface of Android. We quite enjoyed the company’s advanced Security Guard feature, which runs in the background with no additional battery drain. It automatically scans if the system is infected with malware, something slows it down and it can even prevent apps from violating your privacy. For example, Facebook automatically was restricted from accessing the phone’s contact list. The battery is 4,000mAh and is an absolute beast. Lenovo claims it can hold up to 3 days of active use and the device we met was at its second day without a plug, displaying 51% of battery left. We were asserted that the Vibe Z2 Pro hasn’t been idling at all, but we’ll be absolutely sure of Lenovo’s claims once we put it through our extensive battery test procedures. The display, as we mentioned, is a 6” IPS LCD with a QHD resolution resulting in a pixel density of 490 ppi. It’s bright and has great viewing angles. We couldn’t test its sunlight legibility performance, but colors are vibrant and overall contrast is fine. 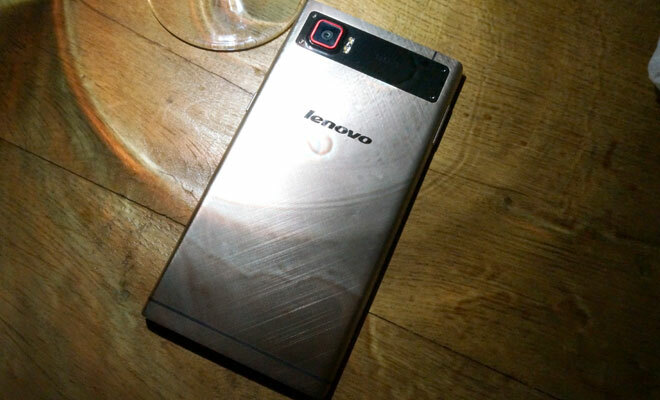 The Lenovo Vibe Z2 Pro is made out of metal, but is surprisingly lightweight for such a gargantuan smartphone. At 179 grams it manages to beat the Samsung Galaxy Mega 5.8’s weight, albeit by 3 grams and be a tad heavier than the similarly sized Sony Xperia T2 Ultra. In fact, both measure 7.7mm thick, but the Vibe Z2 Pro is more compact by a few millimeters in both height and width. Anyway, the Chinese company has delivered superb feel in the hand with the Vibe Z2 Pro. Every millimeter of it feels nothing short of premium and the red accenting on the camera at the back gives it a cool twist. Speaking of the camera, it’s a 16MP shooter with optical stabilization. It’s also capable of recording 4K video at 30fps. The phone, however, isn’t without its drawbacks. There’s no microSD card slot to complement the 32GB internal storage and the Vibe Z2 Pro doesn’t support Wi-Fi 802.11ac. And we feel a smartphone of such rank deserved to have those features. Nevertheless, we can’t wait to get a retail unit of the device and give it the full review treatment.